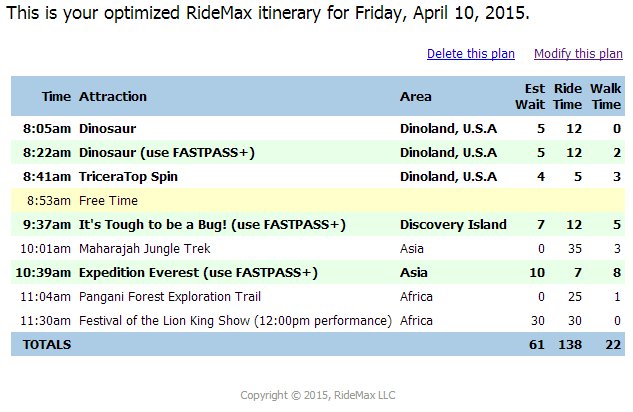 RideMax Roulette at Disney’s Animal Kingdom Tomorrow! I’m calling this “RideMax Roulette,” because rather than using a predetermined list of attractions, I decided to plug in a (mostly) random list of shows and attractions into RideMax, then created my half-day plan from there. I know this may seem like a pretty wimpy attempt, given that the plan doesn’t include the Safari, but hey, it is what it is. I think it’s also good for me to test RideMax plans that include non-obvious ride selections, as it has sometimes helped me to see and/or fix problems that might come up with various ride choices. Notice the large-ish block of “free time starting just before 9:00am. I think I’m going to use this to go see DiVine near the park entrance. I’ll keep you updated on Facebook and Twitter as I progress through the morning. Feel free to comment there or below as I go! Just a quick post-mortem note here. For those who followed along, you know that this went fairly smoothly. There were a couple of glitches in the day that I thought were worth mentioning. First, there were a couple of large backups on the freeway due to accidents, which put me in the park about 10 minutes late. Fortunately, since Dinosaur was the first on my list and wasn’t super time-critical, this worked out fine. In general, if something super-time-critical were first on my list (nothing at AK, really, but Peter Pan at Disneyland is an example), I might have had to skip that first attraction instead, or recalculate the plan with the later arrival time. At Disney World, I only want to recalculate as a last resort, due to those FP+ reservations. The second glitch was that when I arrived at It’s Tough To Be A Bug, it was temporarily closed due to technical difficulties. In this case, I just moved on to the next item on the list and then came back later, which worked just fine. By the way, something that helped me stay “on schedule” despite the late arrival and taking time out to post live updates on Twitter and Facebook, was the fact that there was a block of “free time” in the plan. I sometimes see requests from people creating RideMax plans questioning this free time, but I think you’ll usually find that it works in your favor in the end. 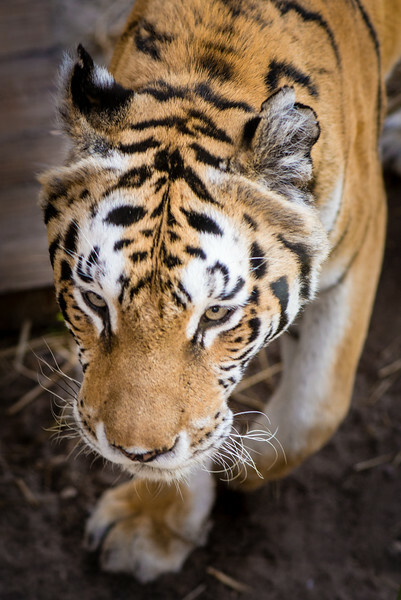 You never know when something unexpected might come up, so the free time offers a margin of safety in the plan, and allows you to have some bumps in your day without the whole plan falling apart.